The approach to learning is an evolving issue. It requires that educators keep up with that evolution and adapt to address the needs. So, it is the same with learning environments. Physical space can be the third teacher, after parents and school organizations. It can assist with the process. It is the educational philosophy / pedagogy that drives education, and it is the learning environments' place to respond. There is no doubt however that Learning Environments Matter. After discussions with school administrators, the shape of the "L" was tailored to meet specific concerns. The two sections of the "L" were each treated differently. The larger section was sized as such to allow for a typical classroom arrangement of 24 students in a variety of seating arrangements. Finishes within this portion were standard: VCT flooring, painted CMU, gypsum board and suspended acoustical ceiling. However, in the smaller section of the "L", the attention was refocused on a setting for specialized learning. This area was envisioned to accommodate classroom needs that would normally require interrupted instructional time for rearrangement. Finishes were treated differently: carpet tile and lower acoustical ceilings reinforced the focused setting. Additionally, the wall shared with the adjacent classroom was slanted to improve sight lines for teachers and students. 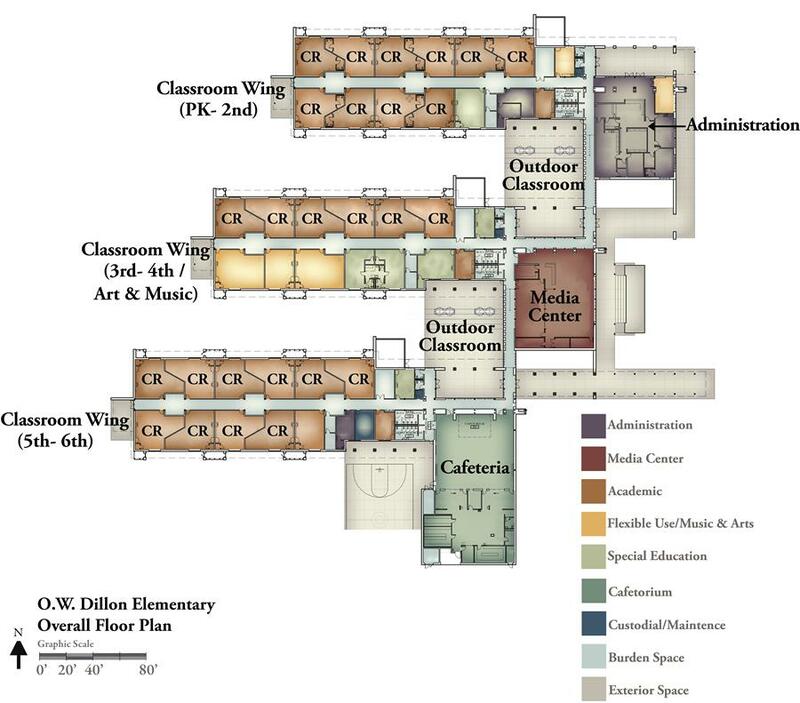 The "L"-shaped classrooms were arranged in groups of 4, clustered around an expanded corridor activity space. This area was also treated differently with the goal of providing an out-of-class, one-on-one scenario for interventions and/or individualized learning. The finish contains tackable acoustic wall covering and carpet tile flooring. Additionally, a full height window was provided into each adjoining classroom to provide a visual connection between the spaces. Our team re-engaged with teachers and administrators five years later to check performance. A questionnaire was prepared and sent to the school principal. The principal asked the teachers to provide feedback, and responses were obtained from 18 teachers within the school. The results were surprising. Nine teachers provided feedback which was generally in favor of the "L"-shape concept, while the other nine provided feedback to the contrary. The responses varied. 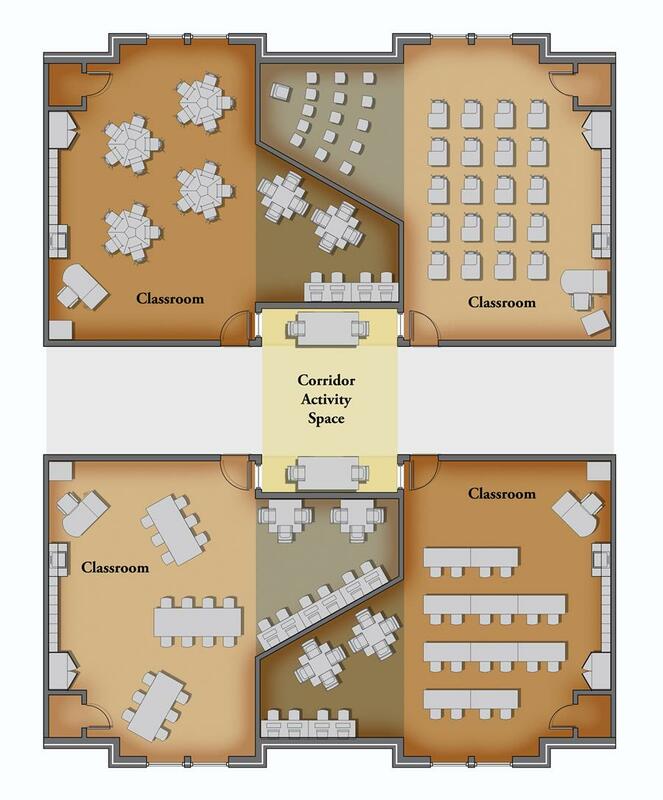 Those in favor provided comments such as, “the "L"-shape classroom allows groups to complete various activities in different locations without distractions”. They also indicated that they use the space for conferencing with students, “cool down” areas, reading activities and learning centers. Some teachers who stated that they did not prefer the "L"-shape configuration indicated it was used in a similar manner. 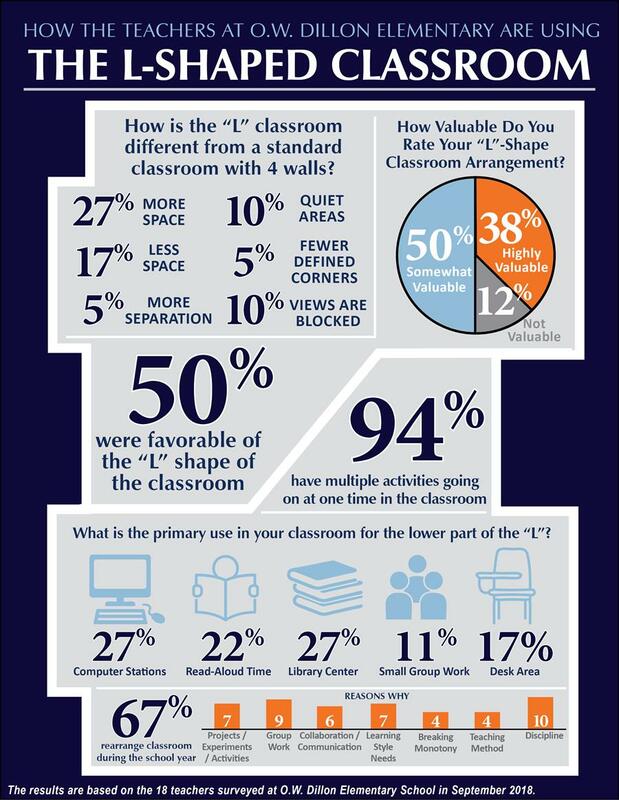 Furthermore, the survey concluded with the question: Do you think the L shape classroom was highly valuable, somewhat valuable or not valuable at all? Six teachers indicated it was highly valuable, eight teachers indicated it was somewhat valuable, two teachers indicated there was no value at all, and two did not comment on the question. It may be hard to expect a veteran teacher to rethink the way they might use a learning environment. However, there is no doubt that these teachers were very passionate about their work. If we, as designers, can give them the tools in their built environment to help facilitate their mission, they will generally embrace it. Although the responses varied widely, the teachers were in fact using the space as it was intended and the layout was enhanced as a result. H/S’ educational work represents half a billion in construction and includes new school campuses & facilities and renovations. Our focus and commitment to our clients along with our superior understanding of education architecture has led to several longstanding relationships including eleven school parish systems throughout Southeast Louisiana, the Diocese of Baton Rouge Schools, the Archdiocese of New Orleans, and several universities including the Louisiana State University, the University of New Orleans, Loyola University, Southeastern Louisiana University, Xavier University, Delgado Community College in New Orleans and the Louisiana Community and Technical College System (LCTCS). Pierre Theriot is a partner at Holly & Smith Architects. He is a member of the Louisiana Chapter of the Association for Learning Environments (A4LE), and he leads early design concepts and design development for Holly & Smith Architects. He was the project manager and lead designer for the O.W. Dillon Elementary School. Clients who choose Holly & Smith Architects experience a design process informed by open dialogue, confidence and collaboration. 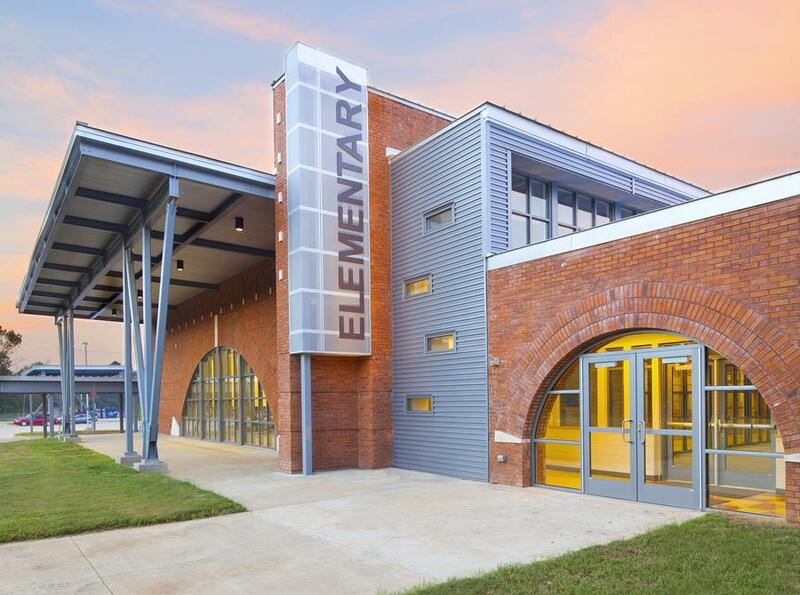 As a regional design firm with offices in New Orleans and Hammond, Louisiana, we have the depth to handle the most demanding projects while our leadership team remains intimately involved from conception to completion. Contact us to see if we’re the right choice for your project.